Last week saw a new chapter in America’s modern political history. The unprecedentedly fierce and targeted campaign launched against a sitting president was pushed further by two more strikes from some of the heaviest guns in the US media. Contrary to its established editorial traditions, the New York Times published an opinion piece by an anonymous author. That anonymous author, whether he or she, was “a senior official in the Trump administration whose identity is known to us” and “part of the resistance inside the administration,” the paper said. 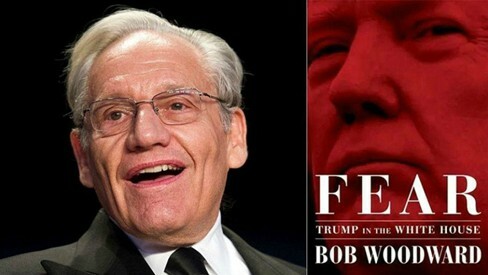 Meanwhile, the US reporter Bob Woodward, one of the men behind the disclosure of the Watergate Scandal in the 1970s, entered the fray with his new book Fear in which he reveals the alarming views of some of the close associates of US President Donald Trump on the president’s overall capacities as leader and commander-in-chief. Woodward’s sudden show in the frenzy will add fresh nourishment to the media dedicated to the ultimate goal of downing Trump. Just a few days before his book becomes available in bookstores, Woodward released a recorded telephone call between him and the president. The call was mainly about Woodward’s complaint about his multiple requests to have a meeting with the president documented in the book. Trump denied any knowledge of such a request and asked Woodward about who the staff members were that he had asked and why he hadn’t called the president’s office directly. At the end of the call, Woodward was quite clear in advising the president of the book’s theme, making it clear that Trump knew in advance that “it will be another bad book about me.” Woodward promised nothing different. For those who have capitalised on the “crazy” management of the president, here is another shameful incident to add in the form of a call between the president and a credible journalist who was neither an enemy nor a fake news author at least up until the time of this telephone call. Neither the president nor his associates will be able to easily handle the intervention of Woodward in the fray over his presidency. Nevertheless, Trump has reacted in his usual way by drawing on his standard vocabulary of “dishonest journalism, fake news, enemies of the people” and the like. Trump has economic achievements to his credit that have not been challenged by his critics even as he keeps reminding them and the American people of the record of economic success that his administration has been enjoying. He talks about these “unprecedented achievements” because he knows full well, relying on his own business culture, that they are what counts to both the US business community and job-seekers. Yet, Trump’s stubborn insistence on recalling the “great success of the economy” may fade over time, especially if his adversaries can outweigh it by emphasising the fears surrounding his presidency that may threaten American values. Cover of US reporter Bob Woodward new book "Fear"
Over recent days, a Senate committee in the US has been conducting hearings on Trump’s nominee to the Supreme Court, Brett Kavanaugh. These have exposed the depth of the divisions in the Senate, which, though part and parcel of democracy, have presented a golden opportunity for Democrats to vent their anger not at the nominee per se but first and foremost at the president. The nominee has faced a uniquely tough time, and the questioning over the days to come will focus not only on his career, competency and credibility, but also on how he responds to the possibility of special counsel Robert Mueller issuing a subpoena for Trump to testify on certain charges. Will Kavanaugh adhere to his view that a sitting president is immune to criminal investigation under these circumstances? The hearings at the Capitol have become a proxy stage on which to grill the president over his pick for the most important post in the US judicial system, exhausting the privileges of the democracy granted by the US Constitution. A positive outcome to the current “battle” in the Senate over his nominee to the Supreme Court will be a victory for Trump. However, the battle of the midterm elections for Congress this autumn will most likely reduce the current turmoil in the media arenas in the US, since then there will be further turmoil surrounding the elections. Further fuel to the fire will be added if the Mueller investigation of Trump’s “alleged collusion” with the Russians in the presidential elections provides evidence for his impeachment.